Scott was upfront with us at his initial job interview that his professional goal at the time was to pursue a firefighting career, and that he was in the queue for enrollment without any kind of timeline or guarantee of employment. He was fresh off of his World Cup biathlon career, and his experience coupled with his philosophies got us excited to the point we were willing to roll the dice and made him a job offer. Although we are disappointed to lose him, we can’t help but to feel so thankful that he could be a part of our program and team for the last year and a half. 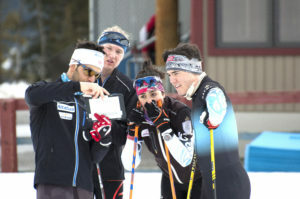 Scott brought a new focus to the program on technical skiing and professionalism. Scott’s focus in these areas was the starting point of a major shift in team philosophy towards movement, something the athletes and staff have all bought into fully. I can definitively say that everyone one of our athletes is a far better skier technically because of their time spent with Scott. Their poles are also much shorter:) We will miss his expertise and knowledge, but I will personally miss his honest humour and very questionable fashion sense. In all seriousness, we sincerely wish Scott all the best in his new career, and want to thank him for making such a meaningful contribution to our athletes, program and ski community.